Box of Challenge is a monthly subscription for puzzle lovers of all ages. Each box includes challenges, puzzles, and brainteasers. COUPON: Use code MSA2018 to get 25% off your subscription for life! Check out more educational and activity boxes in the Kid’s Subscription Box Directory and Geek + Nerd Subscription Box Directory! Inside the information booklet, you get instructions for each task. Each challenge also includes a QR code that leads you to an inspirational element or instructions. They also include the challenge to complete this in 60 minutes. This month’s booklet informs you that the record time to complete this box is 27 minutes! Box of Challenge donates part of their proceeds to NGOs and 10% from this box goes to the American Foundation for the Blind! A stopwatch is conveniently included in the box! I completed the list of tasks with different people so I didn’t time the entire box in one sitting but it was fun to guess how long each task would take, then compare it to reality! Two headbands were also included in the box. They weren’t mentioned for a specific task so I wasn’t totally sure why they were included. A few people ended up using them during the Off The Top Of My Head Challenge to secure the cards to their heads. The first challenge I tackled was the Blindfold Jigsaw Puzzle. The booklet labeled the difficulty as “hard” and I have to say at first I thought this was going to be super easy. A 24 piece puzzle of a cute dog? No sweat! This really was a lesson in patience and listening. One person is blindfolded with the other guides them. My only advice is to try the edges first and be patient with the instructor! This was a really fun task and the QR code for this puzzle leads you to a YouTube video of Nobuyuki Tsujii – a blind pianist and composer. This definitely gave us some inspiration and calm vibes for the jigsaw puzzle! The second challenge was delicious and fun! The instructions for this medium level task are simply to build a 6- story marshmallow tower. This box quickly taught me that I overestimate my skills! This challenge also stressed the importance of communication in a team because it is very easy to create quite a few structurally unsound marshmallow towers! The QR code for this task leads you to an inspirational video of a marshmallow Eiffel Tower being constructed. After a few failed attempts, we had a brush with greatness when our 6 story tower stood for a few seconds. Here is a quick rebuild of our version of the Eiffel Tower (basically the same, right?). You recreate the image with your sticks and the goal is to move three sticks to show only two squares. We also used these to come up with our own puzzles! There are tons of matchstick puzzles available online and it’s (sometimes frustrating) but fun to try them all out! The “off the top of my head” game is a familiar concept that’s really fun to play with a group. Everyone takes turning holding a card up to their forehead and the other players give them hints until they can successfully guess the card. I liked the inclusion of that video because it did give us the idea of doing in the line formation which added a fun level to regular charades. The cards included in this box have the word on one side and a picture of each word on the other. These simple words are great for a whole family game because they’re aren’t too complicated for players of any age to describe. I really enjoyed everything in this box but the Rebus puzzle really reignited my love of pictograms. I remember doing these from the local newspaper every Sunday when I was a kid and they’re still so much fun! The goal of this game is to decipher each pictogram. The booklet sets the goal of getting 15 right. When you have your answers ready you can check them against the answer key in the envelope. “Incomplete pass” was the only one we missed! Verdict: This was such a different type of subscription box for me and I really enjoyed it! The activities really did apply to a nice range of ages and skills. I loved the curation around the theme and the QR extras were really cool! The projects reminded me of fun activities teachers would give you in grade school and I didn’t realize how much I missed team projects. I like that the box can be broken up into a bunch of different activities or you can get down to business and try to beat the record listed in the information booklet. At $21.75 ($29 price of the box with 25% coupon applied), this box felt like a good value to me because there was a nice range of activities for all skill levels that really did challenge us! 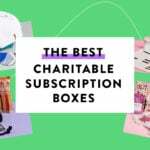 The fact that Box of Challenge donates part of their profits to NGOs dedicated to assisting people with disabilities is also an awesome bonus. What do you think of Box of Challenge? Fun game show I have never seen. Might need to watch more! As a paid member of The Grammar Police, I concur! Still, interesting box. At least I have the red pen to correct where necessary. That was exactly what I was thinking. I also thoughts it should be crossroads instead of road crossing but that is a minor issue compared to the your/rest disgrace!